Average pasture cover (APC) continues to increase this week with residuals struggling to be hit on some of the LI farmlet paddocks. This supports the decision to start shutting up paddocks for conservation. The LI farmlets will have paddocks shut up this week, whilst the expectation will be to shut up at least x1 paddock early next week in the Std FB farmlet. The Std kale farmlet APC will be reassessed at next weeks meeting to determine whether a surplus is available to conserve. The second round of capital fertiliser will be applied across the farmlets this week in the form of Superphosphate. As seen in the table below, rates are applied according to the Olsen P level in the paddock. Std Farmlets will also receive an application of N at 25kg N/ha as urea incorporated with the superphosphate. 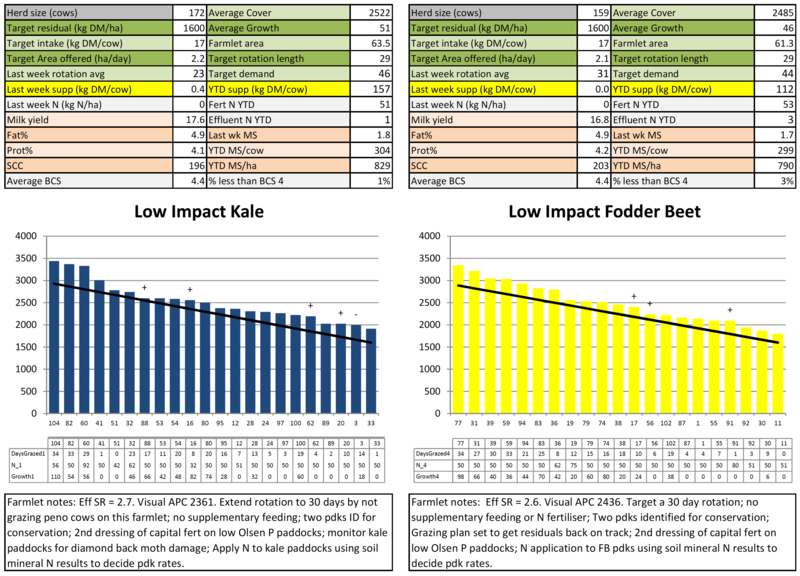 Due to poor weather earlier in the week, the kale farmlets received 2kg/cow/day inshed feeding on Monday and Tuesday. There is no longer any supplement going into the system. The kale crop is starting to show small signs of Diamond moth caterpillar attack. With the wet weather this week, the crop will be reassessed next week as conditions warm up again. 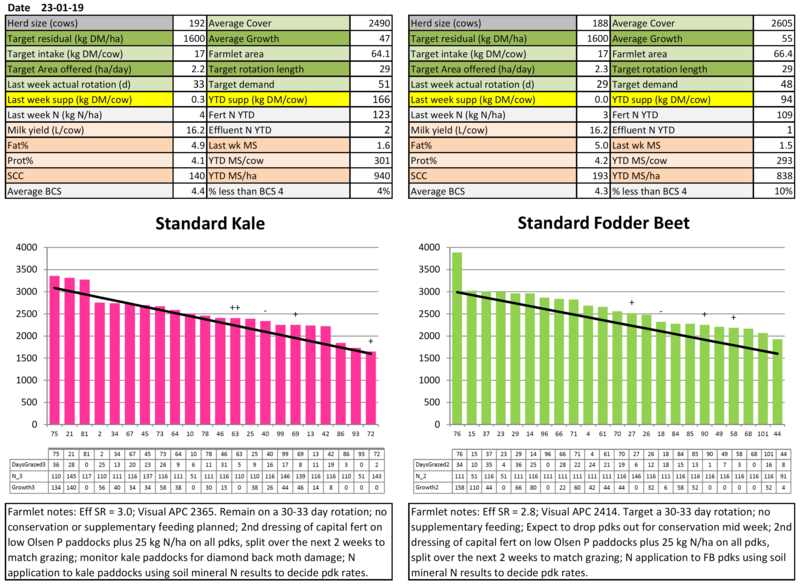 As discussed last week, soil mineral N samples were taken from the 2019 crop paddocks in mid-October just prior to planting and have come back with some very interesting results. Having this information is very useful in determining the amount of N that needs to be applied to crops. With more soil N available in the pasture to crop paddocks the requirement for N fertiliser is lower. This information has been used in determining how much N-protect to apply and amounts can be seen in the table below. Plant & Food research has demonstrated that applying more than 100kg N/ha has shown no yield benefit to FB, so with the initial base dressing of 50kg N/ha, only 55kg N/ha is required as a side dressing on both 1st and 2nd year crops. The application meets the requirements of the Low Mineral N paddocks. In Kale however the recommendation is to apply more N on Low Mineral N crop paddocks as a yield response can be expected. Of interest was that the N levels were lower in the FB paddocks that were lifted at the end of winter and a paddock that have been already cropped for 2 years. These results illustrate the contribution of dung, urine and supplement N to the soil during the grazing process. With 32ml of rain recorded this week, effluent was not applied for 2 days to avoid applying effluent onto saturated soils. The heifers will be scanned and weighed on 5th February. Herd testing and BCS happened this week. Cow BCS is tracking along well, with the Std FB cows having the largest % of BCS < 4 on OAD milking. Results of the January pasture samples collected for quality are summarised below. Differences between farmlets are the result of the proportion of new vs old pastures being grazed during the sampling period. The LI Kale farmlet grazed 2 new grass paddocks and the Std Kale one new grass paddocks. No new grass paddocks in the FB farmlets were in the grazing plan during the measurement period. Paddock ranges for the different components are below. Of the calves weighed, x24 of the lightest were drafted into a separate mob, given an oral drench (Scanda) for worms and Baycox for potential coccidiosis. The larger calves were also given an oral drench of Matrix. Of the 191 calves, x46 at the runoff and x6 calves at home have been transitioned back onto pellets, building up to 2kg/calf/day. SCC is slightly higher this week with x3 mastitis cows identified and treated. In general (Josh Wheeler, QConz) bulk SCC tends to rise 10-20,000 a month post peak – basically the reverse of the milk production graph. The rule of thumb is that if you double peak SCC this will be about the SCC you will dry off at under good proactive management. A heifer was treated at the grazier last week for woody tongue. The first round of interviews for the Hub manager’s role commenced this week. We would like to welcome Baljit Singh to the farm team. He was employed as a milk harvester just prior to Christmas but has started in a permanent role this week. The monthly SDRF Board meeting was held on site this week. The research team and farm hosted Dr Padraig French from Teagasc in Ireland this week. He was in NZ as part of a collaborative project with DairyNZ investigating alternative wintering options for Southland. In addition to visiting the Hub and meeting with the SDRF board the group visited a range of farms across the region that are operating a range of paddock based and off-paddock wintering systems. The visit concluded with a farmer workshop to outline the project, defined the issues and seek support from the industry to continue building the project. Core samples are currently being collected from the different batches of baleage on the farm to ID the best material for lactation feeding.